Cake your way to happiness! 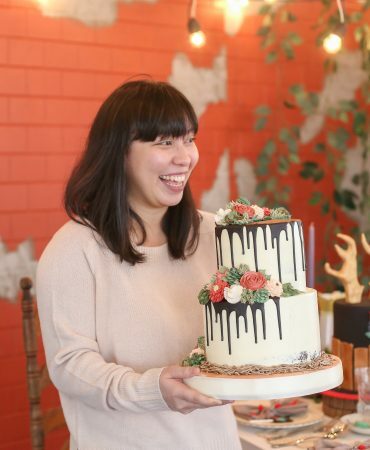 Sugarplum Pastries is a home-based baking business specializing in personalized cakes and cupcakes. From lighted wedding cakes to twirly whirly first birthday cakes we cater sweet treats for your family and friends. Along with our scrumptiously splendid dessert buffet selections we can customize you a package fit in quality and quantity for your event. We have been successfully running for the past 7 years — incoming 8 this January 2018! QC, Ph based. Along the stretch of C-5 Mindanao Avenue, our little plummed nest is located. For orders and inquiries you may reach us here and we’d gladly accommodate you or schedule you in for a meeting as soon as we are able. Steps on how to order can be found below. Taste quality is as excellent as it looks. Since Lovely, who not only came from different starred hotels, also has the passion to conjure magnifique pastry/dessert selections. During the summers, Lala would help out as much as she can being the voice of Sugarplum in all of it’s mediums. Telling the story of how it came to be that this delicacy would be a variety people would surely not want to miss out on — from write-ups to editorials. Until they had been one entity along with the Sugarplum team. Lovely being the soul and artistry while Lala as the voice, body, and coordination. "don't call me chef....... I can't make brownies"
Upon filling out and sending in our order form, which can be found at the bottom most part of this page, via our Contact page kindly wait for our email response as we check our time, date, and venue availability as our cake services are limited per day. We will be sending you then our price lists and a good to know note to guide you regarding purchases. Once we’re good to go we advise you to reserve the date enclosed with a retainer as we send you our acknowledgement contract and bank details before proceeding to seal the deal and block the date. You can check out our previous creations on Instagram and Facebook, or even here in our portfolio. Or you could just send in what you have in mind and we’ll create a whole new output from it. Be sure to coordinate first with your stylists for their output is what we’ll need on the next step. No worries for we send sketch proposals first before production. But do be mindful for we charge upon 3rd sketch revision. We base our designs on your stylist/coordinators’ final mood board containing: invitation layout, stage/backdrop output, color palette to have synchronized designs. Once we’re okay with our sketches and finalities, we’re good to go for pick-up/delivery and party!! !